Who makes One Globe Kids? The One Globe Kids team travels the world to visit real children and their families and spend multiple days recording their story. The first One Globe Kids stories were created in 2009 by Anne Glick to empower parents and educators to share the world with our children. The One Globe Kids education materials are made in by teachers with experience in global education, teaching in public and private schools, in the UK, the USA and the Netherlands. Since 2016, One Globe Kids is a program of Globe Smart Kids, a non-profit social enterprise, determined to make the foreign feel familiar to kids worldwide. Meet the Globe Smart Kids team of experts and supporters here! What is the story behind One Globe Kids? “The idea for One Globe Kids was born one afternoon while I read the children’s book Joyce’s Day to my 3-year-old son in our apartment in New York City. Printed in South Africa in 1974 and given to me as a newborn present by my Aunt Joan in 1975, its photos and simple text made Joyce’s day in South Africa relatable to me, a young, white girl living in small-town Illinois. How can I help more children get access to the One Globe Kids program? One Globe Kids is a non-profit program by Globe Smart Kids. There are many ways to support our work. By joining One Globe Kids as a Family or Educator Advocate you help us give access to schools that do not have the resources to join. Donations big and small go towards new story production and improving the friendship experience, because the more kids like making new friends around the world, the more likely they are to do it again and closer to home. Donate here! When joining One Globe Kids you have the option to sign up for our email news, which we only use for BIG announcements, like new stories, new research or cool changes. For all the other things we have going on please find us online and become a friend, fan or follower. • Join us on Facebook to receive the latest information on One Globe Kids. • Follow us on Twitter to learn about what’s new in the world of Globe Smart Kids, making the foreign feel familiar to kids worldwide. • Find us in Pinterest to see all the globe smart stuff that we have found. • Watch our videos on our YouTube channel. • Sign up for the Globe Smart Kids newsletter at the bottom of the webpage. Is One Globe Kids a virtual exchange? Nope, One Globe Kids is a program for the youngest students. For many of them this is their first experience of meeting a peer outside their daily bubble. There is no actual contact between the user and the children in the stories, it is a simulated experience. For the teachers, there is no need to make arrangements with other classrooms, across time difference and languages. However, cross-cultural visual exchanges are great to do with your school’s students after working with One Globe Kids in lower grades. Is One Globe Kids like having a pen pal? We get that a lot :-). No, One Globe Kids is different. There is no actual contact between the user and the children in the stories. It is a simulated experience, which makes it entirely safe for both participating children and users. One Globe Kids is nearly a cultural exchange for the very youngest. Has One Globe Kids won any awards, prizes, 5 star reviews? Oh yes! One Globe Kids has received 5 star reviews and multiple awards, like an Academics’ Choice Award for Smart Media and a 5 star Educational App Store Certificate. One Globe Kids was featured amongst others in Common Sense Media, Scholastic and the American School Library Journal as an important resource for building cultural literacy and raising global citizens. Check out our Youtube channel for some great video reviews, like the one by the App Fairy and WMTV15. How is One Globe Kids backed by research? One Globe Kids is evidence based. The content is made in collaboration with academia and backed by 70 years of scientific research on intergroup contact theory, cross-group friendship and imagined contact, which positively influence attitudes and behaviors toward others. The University of Kent in the UK uses One Globe Kids in a groundbreaking new study titled: “Virtual intergroup contact to create Global Citizens – Tackling prejudice in children using new digital media” and is currently testing the impact of One Globe Kids with 200+ primary school students. 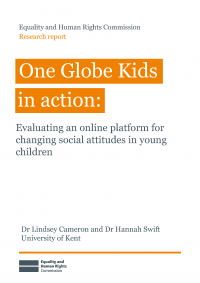 The first outcomes were published in November 2017: One Globe Kids in action: evaluating anti-prejudice projects. You can also find One Globe Kids as a recommended global education resource for the very youngest in the Digital Play for Global Citizens publication by the Joan Ganz Cooney Center. One Globe Kids is a non-profit program. To reach as many children as we can, we try to keep our program as low as we can. Please reach out if you need help to find funding to join! There are multiple ways to explore the world with One Globe Kids. First decide which technology you like to use, iPad or iPhone or computer of smart board. Try for free: Download the free One Globe Kids app via the Apple App Store and visit Valdo in Haiti and Larasati in Indonesia for FREE. Visit more friends via $1.99 in-app purchase. You choose when and where you want to go. Once on your device, you can take them anywhere! All friends: Purchase the One Globe Kids – All Friends app to get all currently available AND future friends from all countries, including Education Toolkits, for only $9.99! Perfect for classrooms, homeschooling and to get all friends at once: Haiti, Indonesia, The Netherlands, Burundi, USA, Israel, and more coming soon. To access all the materials via this website you have multiple options, depending on whether you like to join One Globe Kids as a family or as an educator and whether you like to try first or are ready to travel the world. Sign up with just your email and visit two friends at no cost. Pay an annual fee to access all current and future stories and school activities, cancel any time. Find all the options here and get started: JOIN HERE. Why is One Globe Kids best for children age 4-10? One Globe kids was designed for young children, including those too young to read by themselves. It is fully narrated and includes simple icons so users can easily navigate the series without help. As we all know, children have vivid imaginations, often creating whole worlds around their pretend play. While they’re not really in the ballet or catching bad guys or racing cheetahs, imaginative play helps prepare them for real and active participation in the world. Each One Globe Kids story is designed to stimulate the reader’s global imagination. It’s impossible for most of us to take our children around the world for them to make friends, to learn about other cultures and languages and new ways of doing thing. But One Globe Kids helps to do just that – it makes international friendships feel possible and paves the way for them to be real in the future. We don’t know where our children will be in 20 years. But we do know that in our increasingly inter-connected, globalized world, the ability to interact with a diverse range of people is an amazing asset no matter who you are or where you live. One Globe Kids believes that the skills and confidence needed for global interaction can be encouraged from a very young age. We aim to do just that. Imagine a foreigner coming to you and asking to follow around your child and take photos of them for a book series that you’ve never heard of – and you must communicate through a translator. Only parents who believe it’s important for their own children to know more about the world and see the value in this type of project would even consider participating. The children and families in the One Globe Kids series decided to share their lives with those around the world because they believe it’s important for us all to know more about each other. Depending on the child and family’s situation, an education scholarship or other honorarium may be provided to thank them for their help in fostering global understanding among the world’s youngest inhabitants. As is often said, the world is a small place. To keep the stories as intimate, real and accurate as possible, we rely on personal contacts to find children and families who want to participate. This does not mean that we know people in every country, but that through friends and family we are able to find people who can introduce us to people in each country. One Globe Kids aims to include children from every continent, from North, from South, from East and from West, and also to show the diversity that exists within each country. To highlight this, the series tries to include one boy and one girl with different backgrounds from the same country. This could be different living or socio-economic situations, different religions, different ethnicities, living in different parts of the country, etc. It’s impossible to capture the full diversity of a country or of the globe, but we’re trying. Which countries can I explore with whom? Why photos and not illustrations? As a child, when you’re just learning about the world around you and haven’t experienced or even seen most things, photos help you do just that. In the One Globe Kids series, photos, more so than drawings, give readers a feeling of being close to the children they meet – their expressions, where they live, their families – providing an intimacy that illustrations cannot. Combined with a story told from the child’s perspective and with a child’s voice, the photos make that child as real a friend as possible. What are Global Friendship goals? Preparing students for diverse friendship is an essential part of helping children feel safe, happy and ready to engage within our rapidly changing world. When children feel comfortable approaching and befriending those outside of their familiar bubble, they gain self-confidence and life experiences that they would never otherwise have. They are better equipped to engage, to problem-solve, and to adapt to new situations. For over 70 years, researchers have studied what makes people from different groups get along or not get along and One Globe Kids puts these findings to work in a global context. Global knowledge: Deepening their awareness of families, communities and cultures around the world, including their own, and explore what makes them similar and unique. Culturally-open attitudes: Developing a mind-set and attitudes that are open to differences and sees similarities as opportunities for positive connections. Contact skills: Building self-confidence and comfort interacting with peers in other groups through imagined contact and role-play. Prosocial behaviors: Practicing prosocial behaviors of sharing, working together, trusting, helping and empathy with those in their familiar bubble and beyond. Why is having diverse friends important? In our increasingly diverse world, it is essential that children are prepared not only to manage diversity, but to engage with it (Cameron & Leman, 2015). They must be equipped with the knowledge, skills, attitudes and behaviors that enable them to be informed, engaged and empathetic citizens (UNCESCO, 2014). Children with friends outside their own social, ethnic, racial, economic, or religious bubbles develop important 21st century skills and abilities that those who stay in their own group/bubble won’t. Prosocial behavior, global knowledge, culturally open attitudes and contact skills developed in early childhood will influence choices throughout their lifetime: whom to befriend, whom to help, whom to trust, whom to hire, whom to elect. In adulthood, amplified by economic and security concerns, biases can feed division, hatred and persistent inequality. That is why One Globe Kids is designed as a virtual friendship experience – child users will feel that they have actually met, visited and befriended a peer elsewhere. This lays the foundation for a new generation of problem solvers: global citizens who feel safe, happy and excited about interacting with diverse people and in diverse contexts. What is a global friendship experience? One Globe Kids is designed as a friendship experience – child users will feel that they have actually met, visited and befriended a peer elsewhere. Preparing students for global friendship is an important and valuable part of helping them become active, empathetic citizens. By beginning at an early age, all students can develop the knowledge, attitudes, skills and behaviors that will benefit them individually and collectively as members of a shared society. The Global Friendship Goals used in the One Globe Kids ELA curriculum are based on research in intergroup contact theory and have been specifically crafted to foster intercultural competence and encourage diverse friendship. You will find the goals for each grade in the ELA Teacher guides and one the Education page. What will be better from my family/class: iPad or computer? There are multiple ways to explore the world with One Globe Kids. The stories and online friendship activities are available for the iPad, iPhone and computer. The free ELA materials can only be accessed by joining here on the website. One Globe Kids – free app with IAPs: Download the free One Globe Kids app via the Apple App Store and visit Valdo in Haiti and Larasati in Indonesia for FREE. Visit more friends via a $1.99 in-app purchase. One Globe Kids – All Friends app: Purchase the All Friends app to get all currently available AND future friends from all countries, including Education Toolkits, for only $9.99! Perfect for classrooms, homeschooling and to get all friends at once. Online Friends are available wherever you access the internet. They are also the ideal way to share the materials in a classroom or with groups of children via a smart board or projector. Joining the One Globe Kids is easy. Sign up with only your email and visit two friends for free OR get access to all family materials for $19 OR all education materials for $39 per year. Is One Globe Kids technology safe? While we firmly believe in the power of learning more about each other and sharing across all borders, One Globe Kids also believes it must be done in a way that is safe for children. Protecting children’s privacy online is the responsibility of all of us. This is one reason that One Globe Kids is not a social media platform and does enable actual contact between users. One Globe Kids apps and online friends are certified by the kidSAFE® Seal Program. The kidSAFE® Seal Program is an independent certification service and seal program that reviews and certifies the safety practices of children-friendly websites and applications, including kid-targeted game sites, virtual worlds, social networks, PC and mobile apps, web-connected devices, and other similar online and interactive products. Go to www.kidsafeseal.com for more information. Are the One Globe Kids stories interactive? How? Interactivity means you can engage with something. The One Globe Kid series is designed to encourage children to engage as much as possible with each new international friend, given the language, distance and age constraints that exist. It is not a social media platform, but a story platform. In the “Adventure” version of a new friend’s story, she asks you to choose what you want to do next, just as friends decide together what games they want to play or when it’s time for a snack. For example, Luna in New York City asks, “Do you want a tour of my room or should we have breakfast right away?” You choose! In “Counting” and “Speak with me” each friend invites you to learn their language by listening, repeating and even recording yourself speaking in Kirundi, Dutch, Bahasa Indonesia and all of the other languages in the series. In “Tell me about yourself” your new friend wants to learn about your life, just as you have learned about her life. She asks you specific questions that encourage you to draw parallels between yourselves, such as “I ride my bike to school. How do you get to school?” On the iPhone and the iPad you can record your answers and then listen to your conversation. You can put yourself and your friends/family on the globe, helping to visualize where you live in relationship to your new friends around the world. You can include your own photo or choose an icon in the series – when you’re counting in Kréyol with Valdo or explaining how you get to school, you see yourself in the series with your new friends. Are One Globe Kids education materials aligned with standards? Where do I find the ELA curriculum? The K-2 One Globe Kids ELA curriculum is a free modular way to explore the world with your classroom. Made by and for teachers, all lessons are aligned with Common Core Standards and include activities for reading comprehension, writing, language and speaking and listening. A Teacher Guide explain it all and 11 lessons can be used with one or with multiple stories, for 3 weeks or up to 36 weeks. Find the entire ELA curriculum HERE. And with all the extra available extension activities it is possible to integrate One Globe Kids in more than just ELA! What happens after my students work with One Globe Kids? We have found that children independently return to the stories and interactive features of the series when given “iPad time,” so using it alone or with a parent or caregiver at home is encouraged. Don’t necessarily expect students to bring up what they’ve seen or heard in the very short term. It can take time for this information and this experience to settle. Rest assured, it’s not forgotten and will be brought up again, sometimes when you least expect it. What kind of questions can I expect from my students? One Globe Kids can serve as an entry point to discussing many different topics, from basics (such as morning routines around the world) to more complicated topics (such why it takes so long for one child to get to school or how life would be different without electricity). One of the most unique things about this series is how it makes these types of topics approachable while imparting a positive, open, and non-judgmental view of our world. Our discussion themes and listening and speaking questions can be of assistance, find them here. How many friends should I visit with my class? We recommend visiting a minimum of 3 friends to see an impact on students global knowledge, culturally open attitudes, contacts skills and pro-social behavior. Visiting multiple peers in multiple countries enhances the ability to discuss what children have seen and learned. You can then reinforce the global benefits of the series by drawing simple connections between their lives and the lives of your students. Can I use One Globe Kids to teach ELA? If you teach students in the USA in Kindergarten, first grade or second grade, the One Globe Kids ELA curriculum will do just that. A teacher guide explains how the modular curriculum works, how it aligns with CCS and how it educates global citizens during reading comprehension, writing, listening and speaking and language lessons. 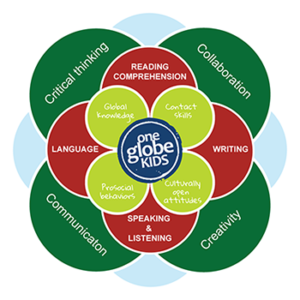 Can I use One Globe Kids to teach ELL? Although One Globe Kids was not specifically designed to teach ELL, we know some parents and educators do use it for learning English. We would love to add an ELL curriculum to the program in the future! I have never travelled and don’t speak multiple languages, can I still work with One Globe Kids? Oh yes! You can explore the globe along with your students and learn together. The FREE One Globe Kids ELA curriculum for K-2 makes it easy to do so, while covering Common Core standards for reading comprehension, language, listening and speaking and writing at the same time. Can One Globe Kids help prepare for a vacation? Sure! If you plan to visit one of the countries featured in One Globe Kids, exploring it before you go will give your child a sense of familiarity that will help with exploring while you are there. Your child will already know things like the local weather, typical foods and what the country might look like. To learn some facts about the country, don’t forget to do the ‘Country Facts’ activity. And of course, learning a little bit of the local language with the ‘Speak and Count with me’ activities, will help with making new friends! My child works with One Globe Kids at school, what can we do at home? Awesome! After exploring the world with One Globe Kids at school, your child can visit more friends or the same friends again at his/her own pace. Since One Globe Kids is created for very young children, little brothers and sisters can join the fun too. Download the app for your iPad or iPhone or join the family program today, you will get acces to all friends and new friends that join in the future.